1. Combine onion, vinegar, soy sauce, garlic, and pepper in a crock pot. Stir the ingredients together then place the chicken on top. Sprinkle the paprika and cayenne pepper powder of the chicken. 3. Add the Bok Choy and turn the crock pot to high and cook for about 10 minutes. Serve over rice. This meal comes from the Philippines. This area of the world has been a cross roads for a long time and has been under the rule or influence of several other countries over its history. This recipe shows a lot of south american influence with a hint of asian flavor. 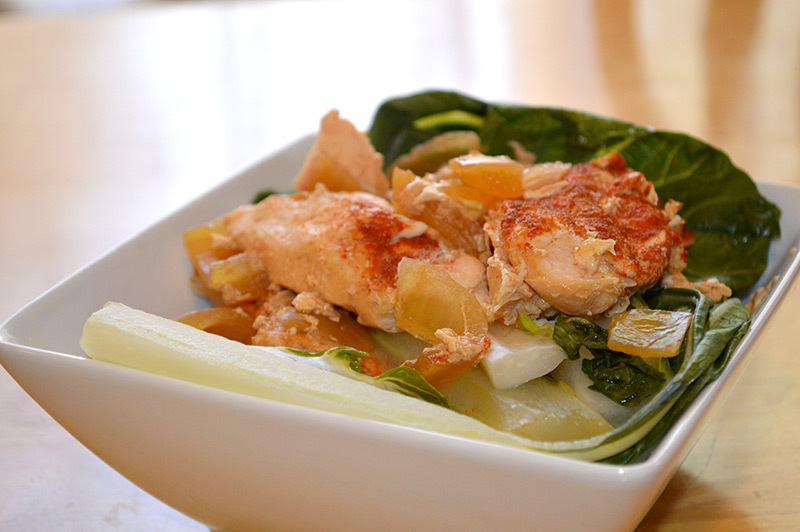 Adobo Chickentastes amazing and adding soy sauce and boo choy gives it a nice twist. The prep is very easy and like most crock pot recipes it’s great for when you want something really good without having to spend a lot of time in the kitchen. We served it over white rice for a great meal. If you felt like it you could pull out some of the water when you’re ready to serve and make a nice sauce to go over the dish using a bit of corn starch to thicken it up.